Sunderland XI: Mannone, Jones, O’Shea, Coates, Van Aanholt, M’Vila, Gomez, Johnson, Borini, Graham, Fletcher. Follow all the reaction to the Premier League matches here. There is also online coverage of the two late matches. Kevin de Bruyne is announced as man of the match. Wilfried Bony could have a hat-full. Again played through by Kevin de Bruyne, his shot is parried away by Vito Mannone. City have got this won - they had after 25 minutes - but the big question will be how is Vincent Kompany? A huge blot on the afternoon at the moment. Kevin de Bruyne - again - has a curling shot saved by goalkeeper Vito Mannone but striker Wilfried Bony blazes over from close range. Now Sunderland defender John O'Shea is down. He is walking freely. Stand down. "Wilfried Bony, what a disappointing penalty. We've seen some really good spot-kicks today but this was not one of them. It was hit way over the bar." Remember that good news Man City fans? It is now bad news. The Man City skipper limps off just minutes after coming on after eight matches out. That looks like it could be the calf again. Kevin de Bruyne wanted to take the penalty, but it is Wilfried Bony who steps up and blazes the ball over the bar. David Silva earned the penalty after being caught by Seb Coates - it looked to be outside the penalty area. There is absolutely no sign of a Sunderland comeback here. City back on the attack. Big news for Man City fans as Vincent Kompany comes on after eight matches out. Boy, have you missed him. City haven't looked convincing defensively and - there you go. Substitute Lee Cattermole hopelessly mis-hits a shot but it falls into Fabio Borini's stride and, after his first attempt is saved, he converts. Slight chance? Possibly not, but for eight matches in a row City haven't kept a clean sheet. "Kevin de Bruyne has got so many qualities but probably his biggest two are his excellent delivery and he is very cool in front of goal. "That finish was so composed - he just passed it into the net." Kevin de Bruyne dances towards Sunderland's penalty area, gets a lucky break, as his attempted pass falls back in his stride, and he coolly converts. The Belgian has been sensational. The big question remains whether City can keep a first clean sheet for eight matches. Brilliant from Kevin de Bruyne as he flicks the ball into David Silva's path. The midfielder has a curling effort palmed away by goalkeeper Vito Mannone. Can Sunderland do anything about it? Before today, Manchester City were unbeaten at home against Sunderland in the top flight for 13 matches spanning 34 years, winning 10, drawing three and scoring 36 goals. That could not be much easier for Manchester City. They have been brilliant going forward - defensively, not entirely convincing still. "Raheem Sterling looks onside to me. A lot of people have been talking about Sterling needing to time his runs better, but on this occasion he did really well and is onside in my opinion. In line with the last defender." This is absolutely relentless from Man City. Every time Kevin de Bruyne gets the ball on the right, you expect a goal. He slips Raheem Sterling through on goal, who finishes with aplomb. Kevin de Bruyne is simply outstanding. This time Fabio Borini gets in but his low shot from an angle is easy for goalkeeper Joe Hart. City don't look great defensively though. A rare Sunderland chance as Steven Fletcher diverts Patrick van Aanholt's low cross over the bar. At the other end, David Silva dances through Sunderland's defence but strikes inches wide from 20 yards. Things don't look particularly rosy for Sunderland do they? The team that has been 19th in the Premier League on Christmas Day has gone on to be relegated in each of the last four years. Where are Sunderland? Yes, 19th... over to you Mr Allardyce. "It's disappointing this from Sunderland. It's not acceptable. This form is going to see them relegated. "It's another wonderful ball from Kevin de Bruyne but there was no physical challenge on Wilfried Bony. When you play for a Big Sam side, those are the details you work on. So far, Sunderland have let themselves down." Regretting that journey to the Etihad, Sunderland fans? This could get embarrassing. Kevin de Bruyne floats in a cross from deep and Wilfried Bony is unchallenged to guide the ball home with his head from the penalty spot. We haven't even hit 25 minutes yet. So close to a lifeline. Fabio Borini does brilliantly on the right. He twists and turns and finds Danny Graham inside the penalty area. The Sunderland striker throws himself at the ball and heads just, just wide of the net. "Huge credit to Raheem Sterling for the first Manchester City goal. To be able to direct the ball so accurately when the ball had so much pace on it, that is a real skill. "On the second goal though, Sunderland just backed off Yaya Toure. I don't think you can have a go at the goalkeeper, but Sam Allardyce will be disappointed with the defending." David Silva tucks the ball into Yaya Toure and, 22 yards out, the Man City midfielder drives the ball into the bottom corner. Sunderland - this does not look good. Kevin de Bruyne pings in a beautiful cross from the right and the dimunitive Raheem Sterling somehow climbs above Billy Jones and heads into the net. Yes a Sterling header. Awful from Jones. Steven Fletcher is almost played through for Sunderland but good defending by Eliaquim Mangala as he stretches out a foot after a sliding lunge - we haven't said that too often in recent weeks. Sunderland need to try and get hold of this. As soon as they get possession, they give it away again. Raheem Sterling cuts inside Billy Jones in the penalty area, the Sunderland defender woefully kicks out and the City man goes down. A penalty surely? Nope, Sterling is booked for diving. Harsh, very harsh. "If you look at the talent they have got in their squad, it’s clear that Manchester City really should be winning the league title this year. "City should be running away with it but they're not, because defensively they are not performing anything like they should be." A confident start from City as they get in behind Sunderland's defence twice in the opening minutes. Nothing comes from either attack, but a worry for the strugglers. Man City fans might not like this one. City have already lost five league games this season and no side has won the title after losing as many times by Christmas since Everton in 1986-87. Should Manchester City be even higher in the Premier League table? Possibly. But their fans will think they should be higher than 12th in our Predictor league table. Sunderland fans, like their side, are scrapping around near the bottom. You can help improve your team's form by having your say in our Predictor game. Billy Jones in goal for Sunderland? Don't worry Black Cats fans... it is a simple typo from Manchester City. Manchester City captain Vincent Kompany returns to the bench after eight games out with a calf injury. Sergio Aguero returns to the bench, having started the defeat by Arsenal, while Fabian Delph also drops out of the starting line up, with Raheem Sterling and Wilfried Bony brought in after the loss to Arsenal. Sunderland defender Younes Kaboul is out because of a hamstring problem, while striker Jermain Defoe remains on the bench. Steven Fletcher starts on his own up front for the Black Cats. Happy Christmas - but let's get on with the serious business. Manchester City start today's Premier League match at home to Sunderland six points off leaders Leicester. They will fancy putting the pressure on today - against a Black Cats side in the drop zone and five points adrift of safety. So, Manchester City are the strongest in the Premier League are they Mr Pellegrini? Time for you to prove it. 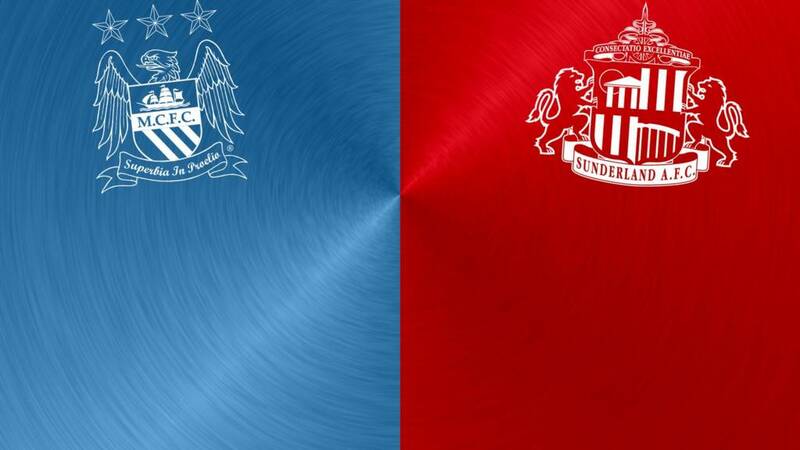 Welcome to our live page for Manchester City v Sunderland. We’ll have text commentary here from 14:30 GMT. You can keep up to date with all the build-up to today’s games here.